(2)DO NOT USE FOR HALF MINI PCI-E INTERFACE, ONLY FOR NGFF INTERFACE. (3)DO NOT USE FOR AMD CPU, ONLY USE FOR INTEL CPU. (4) Important Notice: Please must check and confirm your computer's motherboard whether open USB bus before purchase, because this card is going Bluetooth USB bus, if the motherboard does not open the USB bus, then it's unable to use Bluetooth function, also in the device manager cannot identify the new USB Bluetooth hardware. 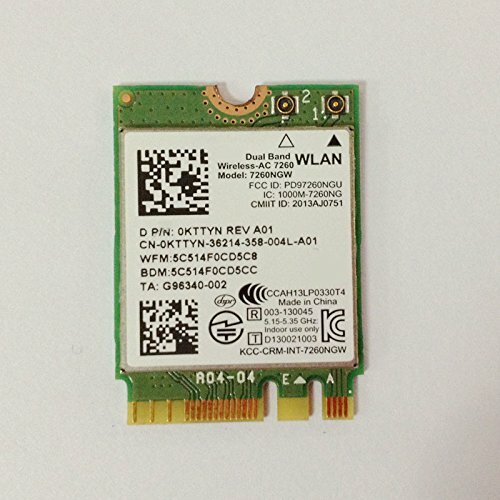 802.11ac, dual band, 2x2, Wi-Fi + Bluetooth adapter lets you move at the speed of life with faster speeds1 (up to 867 Mbps), higher capacity, and better reliability. Less time waiting, more time doing and enjoying. 802.11ac 2x2 Wi-Fi delivers 3x faster speeds1 than 2x2 802.11n (up to 867 Mbps) for faster downloads, higher quality video streaming, gaming, music and more. 802.11ac 80Mhz channels support 3x more data capacity than 802.11n for supporting more devices streaming more data simultaneously. Share your experiences wirelessly on the big screen from your device including the latest 4K high-res movies and HD audio/video. Dual mode Bluetooth 4.0 connects to the newest low energy Bluetooth products as well as your familiar devices, such as headsets, keyboard, mice and more. If you have any questions about this product by PJCARD, contact us by completing and submitting the form below. If you are looking for a specif part number, please include it with your message.